PRESIDENT Emmerson Mnangagwa yesterday called on all opposition political parties to accept his victory in the July 30, 2018 election and join him to fight sanctions so that the country can move forward. 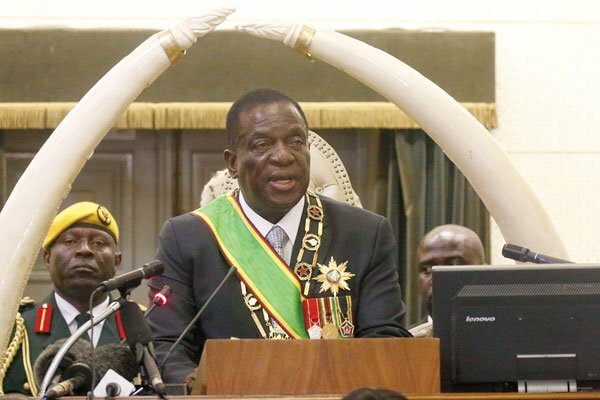 Mnangagwa told a meeting of politicians, who contested the presidential election to draw up terms for a national dialogue, saying the results of the poll should form the basis of the talks. “In view of the July 30 results and subsequent Constitutional Court pronouncements, I suggest that we all accept the results of our harmonised elections as a legitimate expression of the will of the Zimbabwean people, in order for us to focus on the next elections which are due in 2023,” he said. The talks were attended by most of the contestants, but were snubbed by MDC Alliance leader Nelson Chamisa and former Vice-President and leader of the National People’s Party, Joice Mujuru. Mnangagwa said it was important for the opposition to close ranks with Zanu PF and fight the possible threat of new sanctions from the West following a violent crackdown by security forces on protesters last month, which brought comparisons with the dark days of former President Robert Mugabe’s regime. “We have to put our heads together as Zimbabweans to intensify our engagement and re-engagement efforts towards the re-integration of our country into the family of nations and for the total removal of sanctions against our country. The effort must be an all-party affair by way of pronouncements and by way of actual engagements,” Mnangagwa said. The dialogue was moderated by the National Peace Reconciliation Commission chairperson Retired Justice Sello Nare. The post Accept poll results and move on: ED appeared first on NewsDay Zimbabwe. Get rid of Corruption “Chete”. Use Commonsense wena.